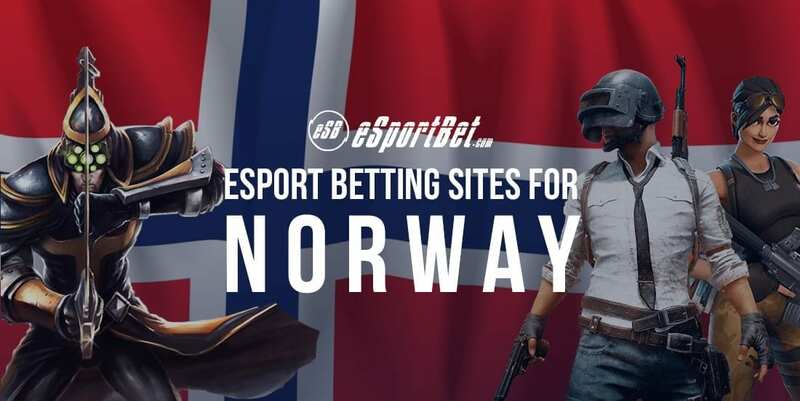 There is a lot of love for esport in Norway, but the nation’s strict gambling regulations are a bit of a pain for anyone who wants to bet on it. Let us show you all you need to know about wagering on pro gaming tournaments, including how and were to bet online with Norwegian krone. Norway’s own betting services are very limited, so your best bet is to check out the many online bookmakers licensed abroad. The companies above accept Norwegian gamblers and offer a wide range of esports betting markets all day, every day. Getting started is easy. Tap the ‘Bet Now’ links to visit the bookie’s website and then follow the prompts to create an account. Fast, secure banking options mean you can begin placing bets as soon as you have completed the registration process, which only takes a minute or two in total. Once you are signed up and have some cash in your account, you need only a few more clicks to get your bets on. Browse the menus to find the markets you want, tap the odds to add them to your bet slip, then set the stake and confirm the wager. You can make multiple selections at a time to create doubles, trebles and even bigger accumulators. Bookies now offer thousands of esports betting options across an ever-expanding range of games, leagues and tournaments. Below are a few of the most popular titles among Norwegian punters. The CS:GO esports scene is among the most hotly contested in the world. Top bookies run markets for a wide array of Counter-Strike tournaments, including the ESL Pro League, the ELEAGUE finals and all the majors. Other games have come and gone, but Dota 2 remains. The world’s best compete on the Dota Pro Circuit for the right to play in The International, which boasted a record prize pool of USD $25 million in 2018. With a massive following in East Asia, League of Legends is the most popular esport in the world. Europe’s top teams compete in the LoL Championship Series and the best of the best go on to the annual LoL World Championship. Blizzard’s team shooter game has gone from strength to strength since its 2016 release. Only Dota 2 and LoL have comparable followings in the esports world, and bookies do a very solid trade on the Overwatch League. The esport craze can trace its history back to the original StarCraft competitions that cropped up in South Korea in the early 2000s. Major events for SC2 include the Global StarCraft League and the World Championship Series. Only two companies are licensed to offer gaming and wagering services in Norway. Norsk Tipping covers sports betting, lotteries and instant win games, while Norsk Rikstoto is the national totalisator agency for horse racing and greyhounds. Both are owned and operated by the state. According to the letter of the law, it is illegal for Norwegian citizens to gamble with any other betting operator. That includes bookmakers, sportsbooks, casinos, poker rooms – any gaming or wagering firm besides the two government-owned companies. Online gambling at offshore betting sites is also outlawed, and it is technically a criminal offence to make payments to overseas gambling companies. Laws against internet gambling are very difficult to enforce, however, and betting remains a popular pastime in Norway. Anybody with a virtual private network (VPN) can visit bookmaker sites with no dramas, while e-wallets such as Neteller and Skrill make it easy to transfer money online while protecting your privacy.